Welcome to Tribe Favourites; our new #TribeVibe series of tips and recommendations provided by our Tribe Teachers on everything from fitness, diet and nutrition, local insights, general lifestyle/ wellbeing and just about anything and everything else! Today we’re discussing with our Tribe Teachers about their favourite restaurants (healthy and not-so-healthy) in the area surrounding our New Town studio location. Leo’s Beanery is Tribe’s original neighbour at our original location, on the corner of Northumberland and Howe Streets. As a beanery, they are known for their delicious coffee, however Leo’s also serves an impressive assortment of options for breakfast and lunch, and some irresistible baked confections. Leo’s is a favourite of Tribe Teachers and clients alike, and you’ll find both throughout the day having meetings or hanging out at Leo’s. Be sure to pop in for a latte or treat after class and say hi! Jacob: I have my go-to breakfast at Leo’s. Poached eggs and smoked salmon with avocado and mushrooms on an English muffin, hollandaise on top. Tessa: I always get a “Tessa Latte.” It’s filled to the brim with whole milk and a ton of sugar. And it has to be in a paper takeaway cup, even if I’m sitting in. Emma Flynn: I also stick with their coffee. I get an oat flat white with just a touch of honey. But I must have mine in the Leo’s china. 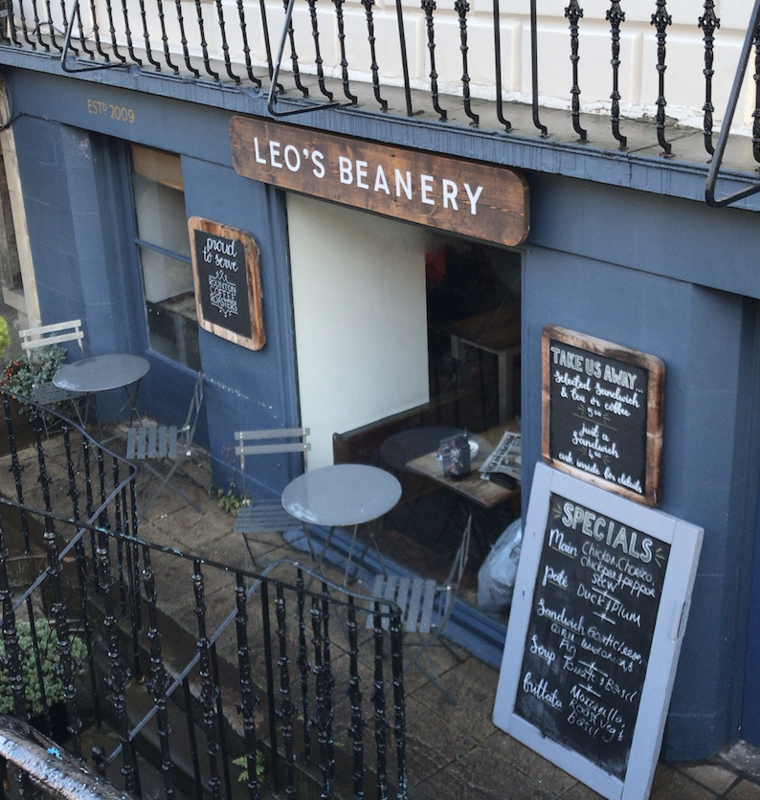 Leo’s Beanery is located at 23A Howe Street, Edinburgh EH3 6TF and can be reached at +44 (0) 131 556 8403. For more information, click here! The entrance to Leo’s Beanery, directly below our original studio in New Town. Just around the corner (literally) is wee buddha, an Asian pub and kitchen. Just a few steps around the corner from Tribe Yoga New Town is Wee Buddha (stylised “wee buddha”), a small but eclectic Asian restaurant that doubles as a pub with a strong selection of draught and bottled beer. Think of an Asian fusion bistro with a Scottish pub-like vibe at very reasonable prices. wee buddha is a favourite for staff special occasions, and a charming spot for a cozy cocktail or a wee date night. Tessa: The salt & spicy squid is a must-have. Adam: Haggis wontons. I absolutely love haggis. I actually had haggis pizza for dinner last night. 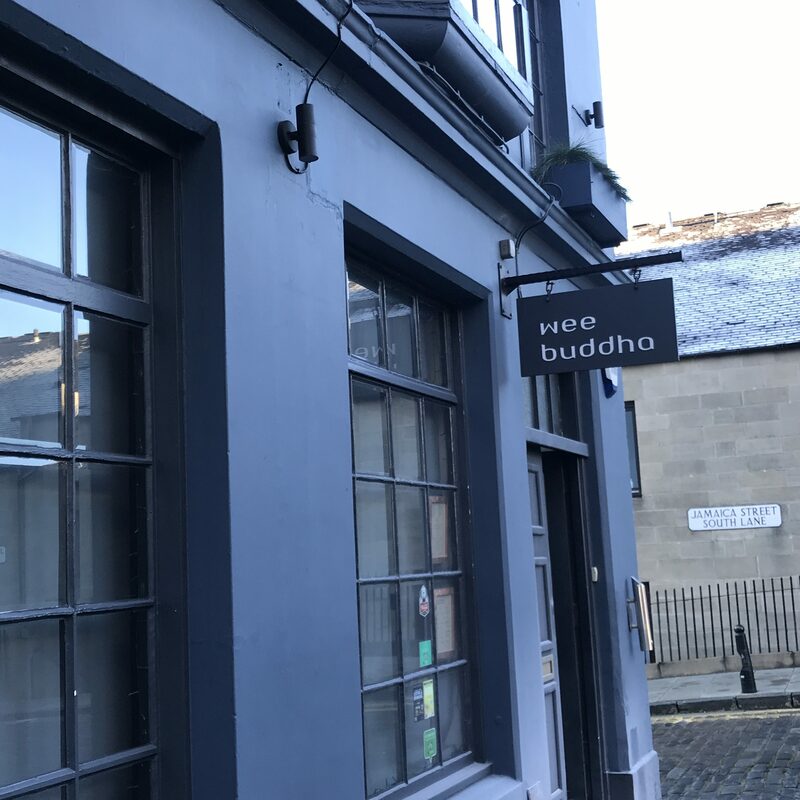 wee buddha is located at 2B Jamaica Street, Edinburgh EH3 6HH and can be reached at +44 (0) 131 538 1215. For more information, click here! The Henderson’s family of restaurants are an Edinburgh staple, serving high quality vegetarian and vegan dishes since their first storefront opened in 1962. About a 6 minute walk from our New Town studio, Henderson’s Salad Table Restaurant, Henderson’s Vegan Restaurant, and Henderson’s Shop & Deli are all located on the corner of Hanover and Thistle Streets. Henderson’s Shop & Deli is the original Henderson’s location (then known as Henderson’s Farm Shop) and Salad Table opened the following year, with Henderson’s Vegan opening five years after that, in 1968. The Salad Table Restaurant is also known for its evening ambiance and live jazz music. Good food for the body, good music for the soul! Henderson’s Salad Table Restaurant is located at 94 Hanover Street, Edinburgh EH2 1DR and can be reached at +44 (0) 131 225 2131. 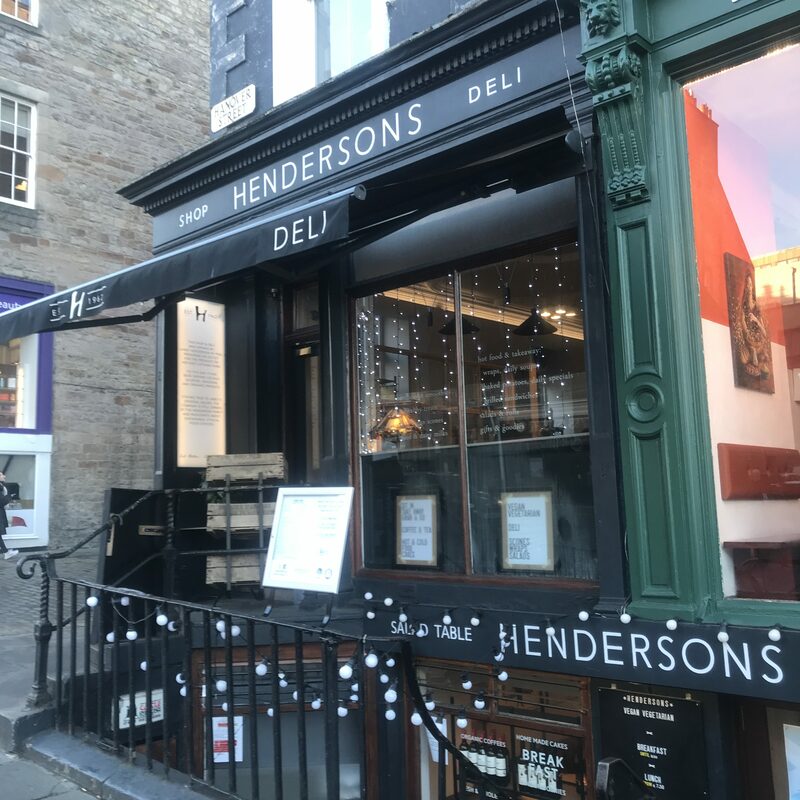 Henderson’s Shop & Deli is located directly upstairs at 95 Hanover Street, Edinburgh EH2 1DR and can be reached at +44 (0) 131 225 6694. Henderson’s Vegan Restaurant is located behind the Shop & Deli at 25C Thistle Street, Edinburgh EH2 1DX and can be reached at +44 (0) 225-2605. Henderson’s has been a popular vegetarian restaurant chain since it first opened in the early 1960’s.